Vampire Hours: Anastasia Beaverhausen for President? Now, that would be a fun president! 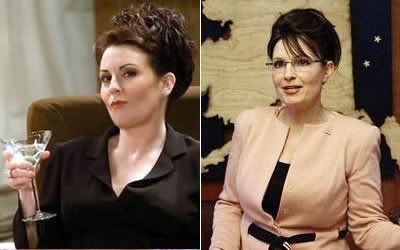 Not Sarah Palin...but TV's Karen Walker, aka Anastasia Beaverhausen (Anastasia: as in Russian Royalty. Beaverhausen: as in "where the beavers live"). They do look a lot alike in pictures, don't you think? AfterElton has a list of famous people that Ms. Palin resembles, which may or may not help her during her run for the White House. Regardless, I'd rather wait for Karen Walker to run, with Beverly Leslie as her VP. Don't forget to include Tina Fey.